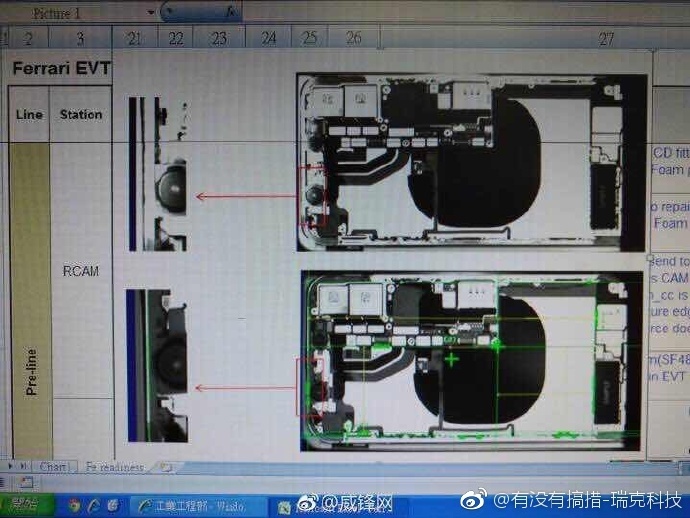 A Foxconn employee has allegedly taken new images of the iPhone 8's internals and posted them to the Chinese social networking site Weibo over the weekend, providing a look at the inside of Apple's OLED iPhone that's expected to be announced next month. The images lack a layered glimpse into the iPhone's internal components, so they were probably not taken via x-ray and were more likely captured through some other form of black and white image processing. 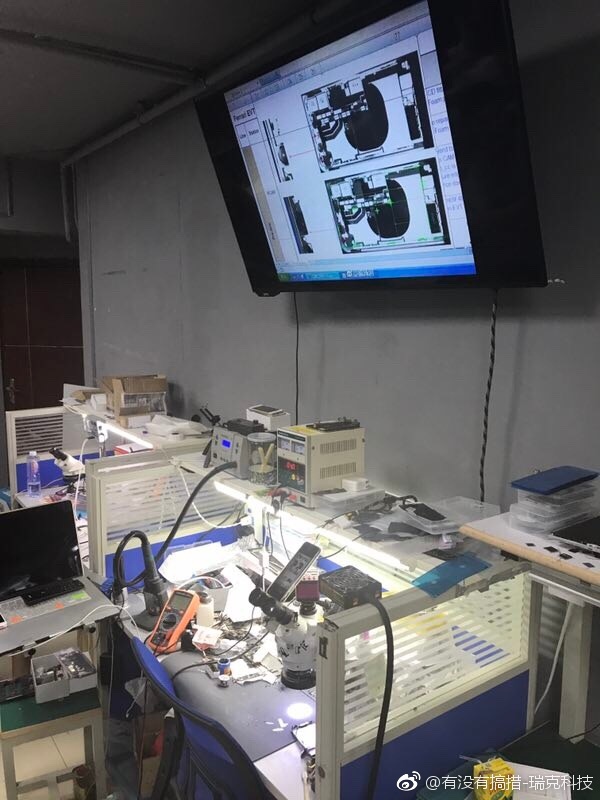 The images depict an iPhone in the "engineering validation test" (EVT) stage of manufacturing with a codename of "Ferrari," the internal name for the iPhone 8 that was previously leaked in supply chain documents late last year. Within the iPhone 8, there's a large, central black spot that represents the device's wireless charging coil, which is what will fuel the smartphone's long-rumored wireless charging features. Otherwise, you can see the dual camera module for the rear camera, blown up shots of what appears to be the front-facing camera or sensors, a large space for the L-shaped battery, and a stacked logic board design previously rumored by KGI Securities analyst Ming-Chi Kuo. These changes will result in an iPhone with a longer battery life, which Apple hopes will entice those with older model iPhones to upgrade this year. The EVT stage that the iPhone 8 images represent is a very early stage of manufacturing for Apple to be in at this point, with design validation tests (DVT) and production validation tests (PVT) to go ahead of a consumer release. This calls the validity of the images into question, but they could have been taken at an earlier date. At this point, we know that Apple supplier Samsung Display is entering into full scale production for iPhone 8 OLED panels, while numerous reports have pointed towards a shortage for the iPhone 8 come launch. Feeding into more delay and shortage rumors surrounding the iPhone 8, Foxconn vice president Luo Zhongsheng said that the yield rate of the iPhone 8 and its OLED display is only at 60 percent -- a number previously estimated by industry watchers -- because crafting the "special-shaped" OLED display is proving difficult (via MyDrivers). The vice president shared the news on Weibo, and the post has since been deleted. Zhongsheng was likely referring to the front-facing "notch" that's rumored to hold the iPhone 8's camera and 3D sensors for facial recognition. Rumors and leaks related to the iPhone 8 are growing more and more steady as we near the device's announcement, expected at an event in September. Thanks to the release of the HomePod's firmware, we now know the general front-facing design of the iPhone 8, and that the smartphone might record 4K video at 60 fps. The facial recognition system was also discovered to potentially be able to scan a user's face even when the iPhone is lying flat on a table. Fake! No long Chinese fingernail is found in any of these photos! I expect the best Craig Federighi leaking jokes at the iPhone 8 announcement. Thought 1: Wait. How was this photo not taken with a potato? Thought 2: I hope they tagged it as #ShotoniPhone ('https://www.macrumors.com/2017/08/07/apple-instagram-account/') on Instagram. A lot of the machines we use for production are disconnected from the internet, receive no software updates and get changed only when they absolutely have to. Removes any unnecessary vulnerabilities or variables. What is the current rumor on price? Are people thinking $849 (7S $649, 7S+ $749, 8 $849)? Or is it actually much higher? Oh my sweet summer child. It won't be called the iPhone 8 and it'll be much, much higher than that. This thing is going to seem old by the time it actually gets released, as there won't be any surprises left! ?